New Traits Don’t Automatically Translate to Highest Yield! In this brief article I would just like to highlight four points to consider when making soybean variety selection choices for 2017. Remember every variety must stand on its own. Use independent trial data and pick varieties that not only perform well (we call them **starred varieties**) but also have the traits you are interested in (e.g. herbicide tolerance). Please see the 2016 Wisconsin Soybean Variety Performance Trials for individual variety performance as we have RR2X varieties starred in each region. 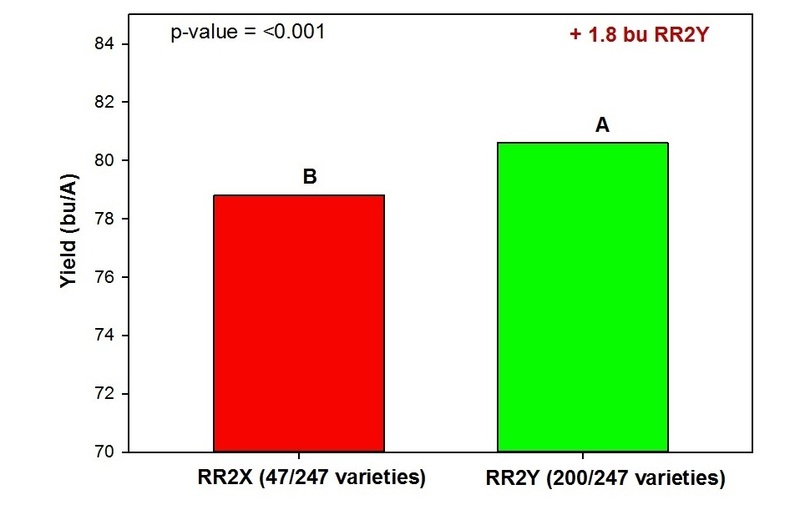 RR2X soybeans are a stack of herbicide traits and not yield traits (i.e… these traits protect yield, not enhance yield). Remember this point with all pest management traits! Hey Mr. Ivory Tower if I don’t use this technology my yield loss will be a lot more than 1.8 bu per acre. I am fully aware of the amaranthus spp. train wreck across much of the corn belt and mid-south. We are starting to see herbicide resistance move across Wisconsin as well. I just want to reiterate #2 above that every variety must stand on its own as well as remind growers to use multiple modes of action and consider incorporating other traits such as Liberty Link soybeans into your soybean weed management plans. All of the data and models I have seen suggest that the Dicamba tolerant crops shelf-life will be much shorter than the original RR if we don’t mange this technology correctly.